Abstract: Phanteks' PH-TC14PE (red) heatsink is compatible with Intel socket 775/1155/1156/1366 and AMD socket AM2/AM3/FM1 processors. 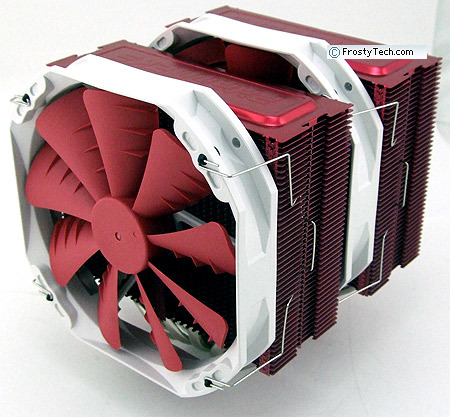 On Frostytech's test bench today is Phanteks's PH-TC14PE (red) heatsink. This CPU cooler comes in blue, red, red and white colour variations for those discriminating enthusiasts who like to colour coordinate their entire PC. If you've already read Frostytech's review of the blue PH-TC14PE heatsink (based on averaged results data from all four colour variations tested), you won't find many differences in this review. Still, we're posting separate reviews for each colour variation of the PH-TC14PE so readers can see what the different heatsinks look like. For all intents and purposes though, our comments are identical. Test data has been updated to reflect results from the red version of the PH-TC14PE heatsink. The Phanteks PH-TC14PE (red) itself is a pretty standard dual tower, five-8mm-heatpipe-packing heatsink that retails for about $90 bucks. It stands 168mm tall and has a wide 144x161mm footprint that may have clearance issues on some motherboards where RAM slots and VRM heatsinks are too tall, too near the CPU socket. The cooler weighs upwards of 1250 grams and ships with two 140mm PWM fans arranged in a push-pull configuration (brackets will support 120mm fans). 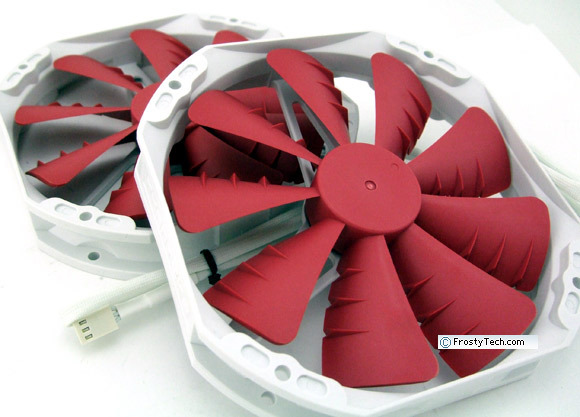 The fans spin at 1200-900RPM and are anywhere from moderately audible to pretty quiet. On the plus side, the dual-fan set up does make this heatsink a good lower noise thermal solution, as you'll shortly see. The Phanteks PH-TC14PE's five, 8mm diameter copper heatpipes fan out from a thick nickel-plated copper base plate into two 115mm tall anodized aluminum cooling towers. Both fans are held in place with easy to engage/disengage wire fan clips that lock into the sides of the fin stack. The fans rest against clear elastomer strips to isolate the rest of the heatsink from minor vibrations and such. Phanteks' PH-TC14PE (red) heatsink is compatible with Intel socket 775/1155/1156/1366 and AMD socket AM2/AM3/FM1 processors. More recent versions were updated to support Intel LGA2011 sockets, but check the box to be certain. The units we tested did not include LGA2011 mounting brackets. 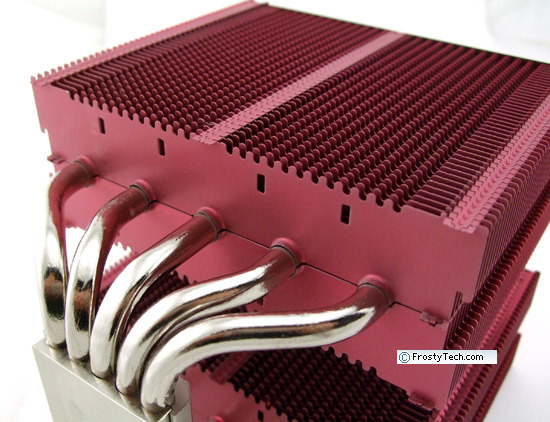 Materials: Anodized aluminum fins, nickel-plated copper heatpipes, copper/aluminum base. The fans that ship with the Phanteks PH-TC14PE (red) are 140mm in diameter and use a nine-bladed impeller with three small notches and vertical winglets on each blade. The manufacturer describes the bearings thusly; "updraft floating balance bearing". Translation = sleeve bearing. Each fan is rated for 78-60CFM of airflow, at 1.21mm - 0.69mm H20 air pressure. The 140mm fans mount with wire clips that lock into little notches running along the outside edge of each 115mm tall aluminum fin stack. 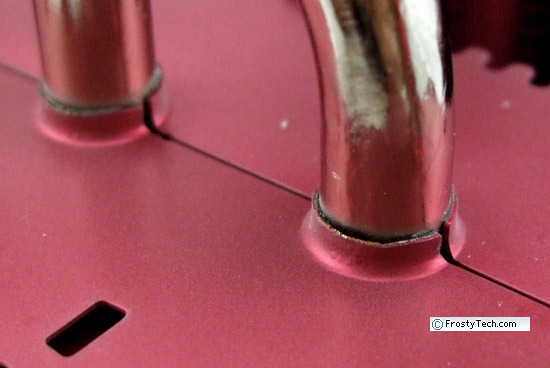 Unlike heatsinks that use rubber posts to hold their fans in place, there's no chance of a wire clip failing after years of heating and cooling cycles. With an aim towards lowering thermal joint resistance, the nickel plated copper heatpipes and aluminum fins are soldered together. It's difficult to say how 'complete' the soldering job between the fins and heatpipes is... some gaps are visible on close inspection. Phanteks' PH-TC14PE (red) heatsink is compatible with Intel socket LGA775/1155/1156/1366 and AMD socket AM2/AM3/FM1 processors. 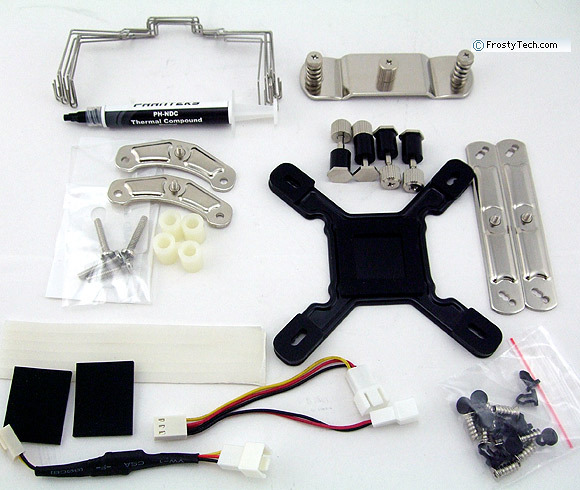 The CPU cooler ships with a variety of brackets, separated into several packages for AMD and Intel processors. For each CPU socket small metal tabs are first attached to the motherboard, a plate then mounts over the heatsink base and everything fixed in place with two spring-tensioned screws. The instruction manual makes installation of the nearly 1.3kg heatsink pretty straightforward. Both fans are installed with clear rubber anti-vibration strips across the edges of the thin aluminum fins which is a nice touch. A small syringe of thermal compound and a pair of fan cable adaptors are supplied too. List all Phanteks heat sinks that Frostytech tested?